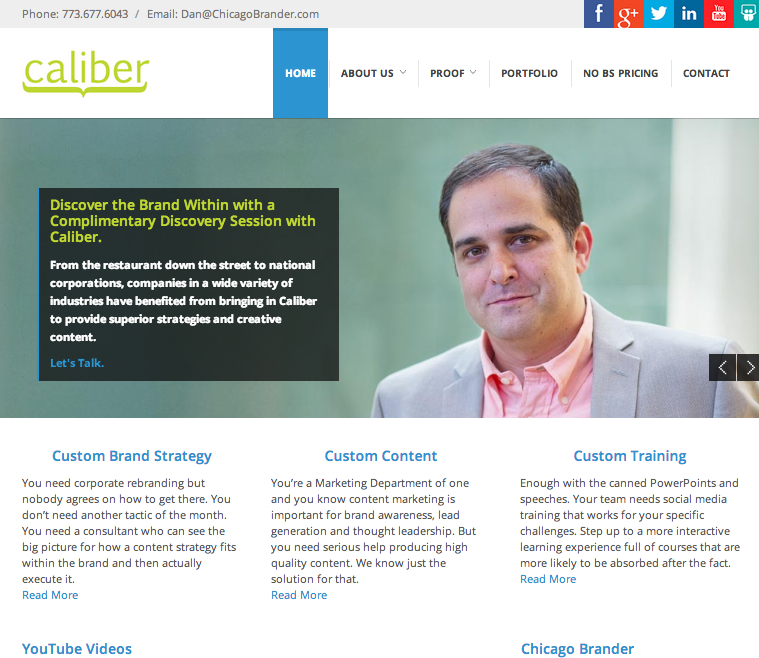 In the second part of my writing about working on your own agency brand, I’m really excited to share the news that Caliber’s new website is launched!! Go check it out when you get a chance and let me know what you think. Personally, I think the design rocks, thanks to Zach Weiner of Tandem Multimedia Partners. I’ve known Zach for 15 years dating back to the first agency we worked at together, so I feel very lucky to still have terrific relationships like the one I have with him. If you have the opportunity to work with Zach and his partner John Bauman, you’re in very good hands. I highly recommend them. OK. Now let’s talk about you. How do you get your own agency’s site up and live in a timely fashion when you’ve got so much other client work to do? 1) I’ve said it before and I’ll say it again: You have to see your own agency as a client. 2) Get a solid strategic partner to help you divide and conquer, especially on the things you don’t do best, have time for or internal resources to spare. Granted, I’m coming from this in refreshing an existing site with a new look rather than launching a site for the first time. That said, that can be even more of a reason why you might be putting off your own work. “Eh, it’s the next version of our site. We’ve got something up there at least. Nothing to worry about.” Wrong. Even if you have a web designer and programmer in-house, it’s very challenging if not impossible to ask that person (or team) to focus on the website exclusively. So they have to balance it with other client work and…here we go again, the other clients get the priority. Over and over and over again. So what’s the harm in working with contracted talent you trust? Whether you want your in-house designer to work on the agency brand project or you want them to work on other client work, you don’t have to put it all on one plate for the sake of keeping it in-house. Your Data Can Help Too. What’s interesting about that? Well, for one thing, half of these were secondary links underneath the top main menu. What if I moved a couple of them up into the main navigation, like Portfolio and No BS Pricing, to make it that much easier on the audience? So I did that in the new rendition of the site. The other point is that while I had had product-style pages, most people followed a logical order of wanting to see these “about us”-type of agency pages first before they dove into the actual offerings – even though those offerings were seen high enough on the home page. The takeaway is that sometimes through the stats your audience is going to speak loud and clear about what they want to see and share first on the site. Give the people what they want. Make it easier on them to find. Don’t bury it (I can’t tell you how many companies make the mistake of assuming all their stuff is so easy to find on their site. “What? It’s on the home page!” Yeah. But if it’s sharing space with 20 other links, you do the math on the likelihood of visitors going there). 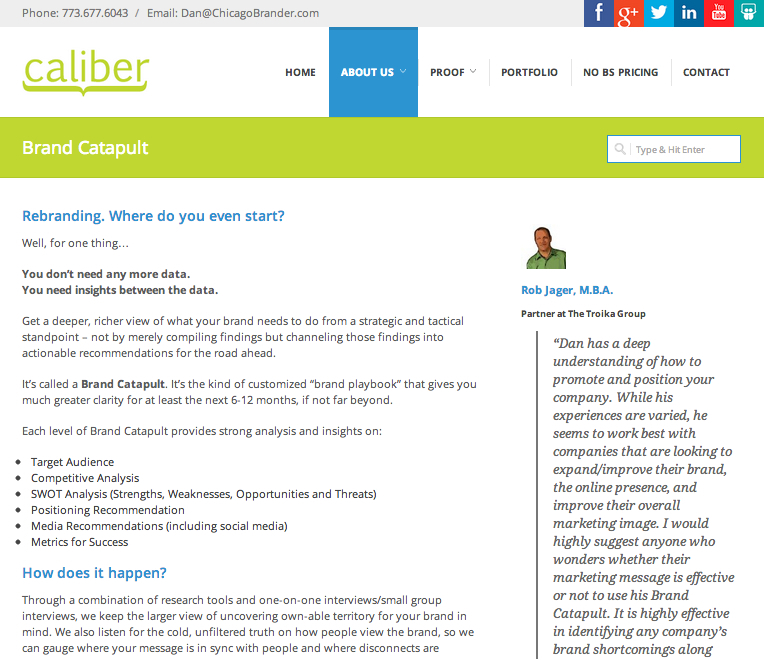 Brand Catapult is our main product for brand strategy. So while it wasn’t the top page viewed, it was one of the top searched for that leads people to our site. Then I noticed that rebranding was ranked high too. These actually go hand in hand, because as I thought back to why people often need a Brand Catapult conducted, most of the time it’s for a rebranding effort. So the language within that page is and will continue to be tweaked to reflect that. The other interesting term? The one about having a pricing range. Now, there’s a fierce debate among people about whether or not to list your pricing on your website. My opinion is this: It’s a conversation you’re going to have at some point anyway if things progress the way you’d like. And clearly here, the audience is telling me it’s something they want more information on, which justifies creating a page for it. Here’s the other thing about that term you’ll notice though – it’s a pricing range they’re asking about. That works well for me, since a lot of what I do is custom, so the prices will vary. But I can still give a decent range in the verbiage I write for a pricing page, which should guide people into one of three options for their budget. Again, it’s giving the people what they want – a little more clarity in advance. If they’re kicking tires on price and they can’t afford it, fine. If they can afford it, that makes our first conversations all the more efficient. So to recap, 1) Think of yourself as a client. When you get into that mindset, think about how you can divide in-house talent with 2) a strategic partner to help share the load. And as you plan around where you want the audience to go, don’t forget to 3) “listen” to what they want through what the data has already told you during their visits. You don’t have to blindly design everything according to what they want – if you want to steer them through a process they’re not familiar with, gently guide them in that direction in your design – but like so many things when I’m creating a brand strategy, you have to get outside your own walls to know how your audience views you and what they value most. That might help you get on the same page. Literally. Now don’t put your own agency brand to the side a moment longer. If that involves content or strategic thinking on where to take it, let me know if I can be of help to keep things moving along for you – dan@chicagobrander.com.